When it comes to protecting your home, most people probably think they don't need or can't really use an automated security system if their house isn't all that big. 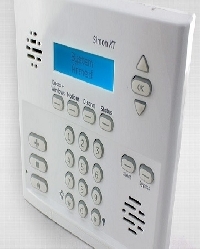 The fact of the matter is that there are plenty of solutions for people who are looking for home security systems for small houses. When shopping for these systems the key factor is just to make sure you aren't actually buying a system that doesn't fit your home well. If you are truly living in a smaller dwelling you may just find you don't need all the bells and whistles of a giant system that has numerous codes and steel doors sliding into place in extreme circumstances. Smaller homes -- or even smaller businesses -- can do more protection with less when selecting the home protection system that fits. The first step in protecting any home from intruders is obviously making sure you know when someone is trying to get into a door or window, especially if you don't want them to have access. The good news is that there are some security companies that are more than willing to tailor their security offerings based on how many doors and windows you actually have. If your house is very small, you don't want to run into a situation where you are buying a package that leaves extra devices laying around. There are companies that can offer you little laser based sensors that allow you to place these at the base of a door or window. When someone opens the door, a signal is transmitted to the heart of the security system and that allows you to know if someone is coming in the house. There are packages that can be added to or taken away from, so that a small home owner has the right number of sensors, without having too many. Because this is a relatively simple setup, there isn't the need for a long process to activate the security system, or deactivate it when the need arises. If you are someone who doesn't believe that you need to invest in a security system to keep people out of the house at all times, there are other ways you can retroactively protect yourself from intruders while also monitoring what is going on in your home from one minute to the next. Small security cameras that are hidden inside regular household items have become very popular over the last few years for just the reason the name implies. People wanted to make sure their babysitters and nannies were behaving appropriately (and not stealing) while they were the only ones in the house. These cameras can be used in order to monitor what's going on in a house and send that video back to the owner, who can then call the police should they feel the need. People using these kinds of cameras can also identify the person who was breaking in and stealing. That can be more effective than simply trying to scare them away with a loud alarm. These cameras can be quite small so they fit well within home security systems for small houses. The next step in evolution for the Nannycam are the digital cameras that actually link up to a smartphone or tablet. Some of the better cameras can actually be operated and moved using a simple application. This allows people who have smaller houses to feel as though they have full control over what's going on in the home without having to purchase a massive system that is simply bigger than what is needed for the size of the house its trying to protect.